Assalammualaikum.. The semester had just started and before I got fully occupied with the assignments, it's the best for me to spend some quality time with my friends.. Since we had no class schedule on Friday, we decided for a hang out and catch a movie for an entertainment.. It was a new released movie in line, so I was thinking, why not if I share this with you guys, kan? 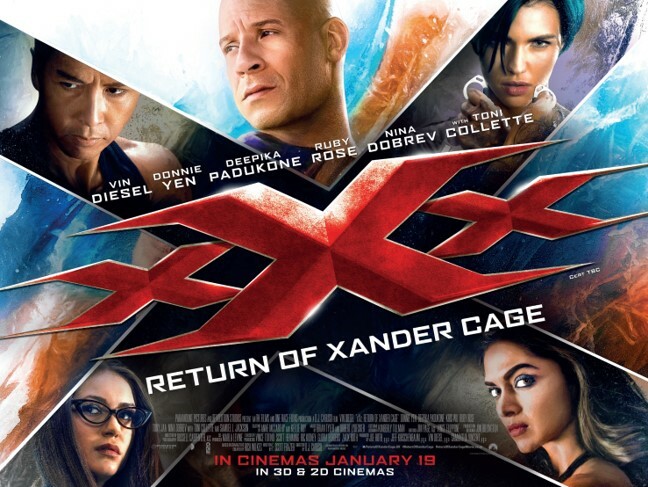 A chaos of the stolen pandora box caused Xander Cage to make a come back, though he was actually announced as dead.. In order to complete the mission, he collected his old fellows but then, surprise by surprise awaited for him.. I should had caught the momentum, since Vin Diesel are there, what else should I expect other than action movie? Sorry for my noob-ie mind.. But oh well, I have to say, this was a great movie and I really enjoy it.. There's no denial that Vin Diesel is one of the best when it comes to action genre and I love the fact that actors from various countries were involved.. I would say, I love every character from the antagonist to protagonist as each of them played their role perfectly..
Self Rating:★★★★☆Overall, it would still be in my favourite movie list, and believe me, it's worth every penny for this good movie.. I hvnt been to cinema for a long time. My movies are on my lappy or hp sometimes. Since you take the time to advertise this movie so, so, what to do, i will still watch movies online. Jom kita tonton movie dalam talian. wah.. mcm best ja ni.. If you were my friend, i'd laugh so hard if you say that you worried it is going to have sexual content for the sheer fact being an 18sx movie. Typical malaysian? LOL. I saw the ads somewhere and dully attracted since it has vin diesel but i didnt notice they have such an interesting casts. Tony Jaa? Count me in. Ada vin diesel mesti best. Hehe. CR dah lama tak masuk wayang. I wanted to but then, I don't want to be a spoiler.. So yeah..
Memang menunggu movie nie keluar.. minat vin diesel nie..
the last movie I watched is the Salman Khan one with a cute kid named Munni. Do you have any other movie's recommendation yang macam deep but at the same time touching.